A profitable strand of literature has lately capitalized on the exploitation of the collaborative capabilities of robotic swarms for efficiently undertaking diverse tasks without any human intervention, ranging from the blind exploration of devastated areas after massive disasters to mechanical repairs of industrial machinery in hostile environments, among others. However, most contributions reported to date deal only with robotic missions driven by a single task-related metric to be optimized by the robotic swarm, even though other objectives such as energy consumption may conflict with the imposed goal. 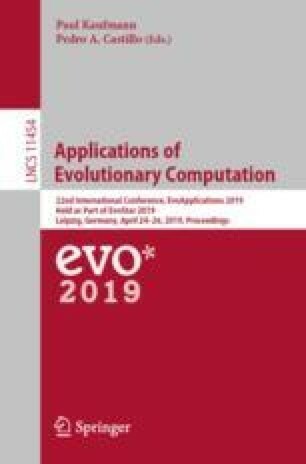 In this paper four multi-objective heuristic solvers, namely NSGA-II, NSGA-III, MOEA/D and SMPSO, are used to command and route a set of robots towards efficiently reconstructing a scene using simple camera sensors and stereo vision in two phases: explore the area and then achieve validated map points. The need for resorting to multi-objective heuristics stems, from the consideration of energy efficiency as a second target of the mission plan. In this regard, by incorporating energy trophallaxis within the swarm, overall autonomy is increased. An environment is arranged in V-REP to shed light on the performance over a realistically emulated physical environment. SMPSO shows better exploration capabilities during the first phase of the mission. However, in the second phase the performance of SMPSO degrades in contrast to NSGA-II and NSGA-III. Moreover, the entire robotic swarm is able to return to the original departure position in all the simulations. The obtained results stimulate further research lines aimed at considering decentralized heuristics for the considered problem. This work was supported by the Basque Government through the EMAITEK program.